Housekeeping – A low-paid job or a profession? Some believe the National Living Wage will help us recruit and retain important front-line staff such as housekeepers. But it’s unlikely to make much difference if there are comparable jobs that pay more, says Christoph Hoffmann MIH. 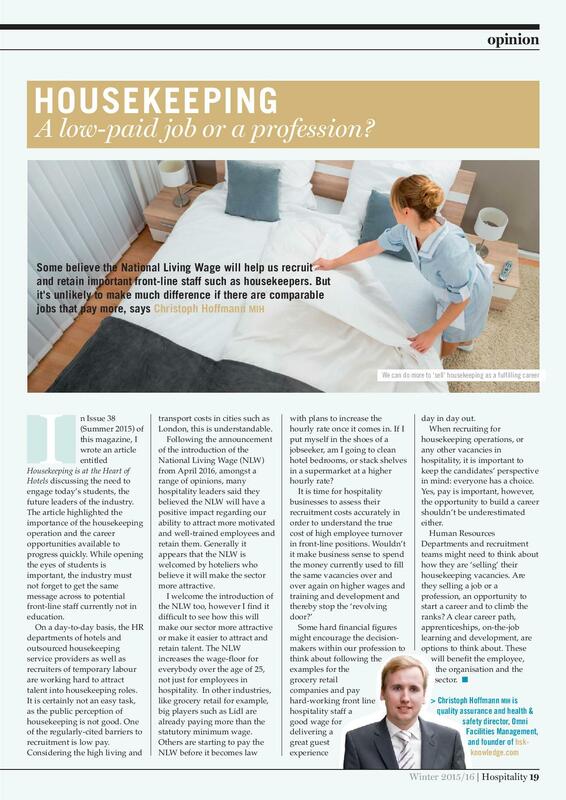 In Issue 38 (Summer 2015) of this magazine, I wrote an article entitled Housekeeping is at the Heart of Hotels discussing the need to engage today’s students, the future leaders of the industry. The article highlighted the importance of the housekeeping operation and the career opportunities available to progress quickly. While opening the eyes of students is important, the industry must not forget to get the same message across to potential front-line staff currently not in education. On a day-to-day basis, the HR departments of hotels and outsourced housekeeping service providers as well as recruiters of temporary labour are working hard to attract talent into housekeeping roles. It is certainly not an easy task, as the public perception of housekeeping is not good. One of the regularly-cited barriers to recruitment is low pay. Considering the high living and transport costs in cities such as London, this is understandable. Following the announcement of the introduction of the National Living Wage (NLW) from April 2016, amongst a range of opinions, many hospitality leaders said they believed the NLW will have a positive impact regarding our ability to attract more motivated and well-trained employees and retain them. Generally it appears that the NLW is welcomed by hoteliers who believe it will make the sector more attractive. I welcome the introduction of the NLW too, however I find it difficult to see how this will make our sector more attractive or make it easier to attract and retain talent. The NLW increases the wage-floor for everybody over the age of 25, not just for employees in hospitality. In other industries, like grocery retail for example, big players such as Lidl are already paying more than the statutory minimum wage. Others are starting to pay the NLW before it becomes law with plans to increase the hourly rate once it comes in. If I put myself in the shoes of a jobseeker, am I going to clean hotel bedrooms, or stack shelves in a supermarket at a higher hourly rate? Some hard financial figures might encourage the decisionmakers within our profession to think about following the examples for the grocery retail companies and pay hard-working front line hospitality staff a good wage for delivering a great guest experience day in day out. When recruiting for housekeeping operations, or any other vacancies in hospitality, it is important to keep the candidates’ perspective in mind: everyone has a choice. Yes, pay is important, however, the opportunity to build a career shouldn’t be underestimated either. Human Resources Departments and recruitment teams might need to think about how they are ‘selling’ their housekeeping vacancies. Are they selling a job or a profession, an opportunity to start a career and to climb the ranks? A clear career path, apprenticeships, on-the-job learning and development, are options to think about. These will benefit the employee, the organisation and the sector.